After my last post about Kashyyyk it occurred to me that I should probably talk about the game's companions a bit more, as the companion system is one of the staples of any Bioware RPG and this is certainly true for KOTOR as well. Carth Onasi: I did talk about him a little bit at the start and mentioned that he reminds me a bit of other slightly hapless-seeming Bioware characters, such as Alistair from Dragon Age, which is to say that he oscillates between being kind of cute and being annoying. He is super hung up on possibly being betrayed because his old mentor turned on him and now serves Darth Malak. If you get him to open up to you a bit more, it turns out that he had a wife and a son who died in the war too... well, the wife did, we don't know for sure about the son and I expect this will turn out to be a plot point later on. I'm kind of thinking that I would like to romance him if that's possible, but considering my luck with these things I probably already messed up my chances back on Taris when I told him off for calling me some stupid nickname. Mission Vao: She's the other one I already talked about a bit, mostly to point out the similarities between her and SWTOR's Vette. She's just as adorable and often makes me think that merely being able to take along two companions with you when out in the world isn't nearly enough. Zaalbar: Initially he was too quiet for my liking, but events on Kashyyyk have certainly endeared him to me somewhat. 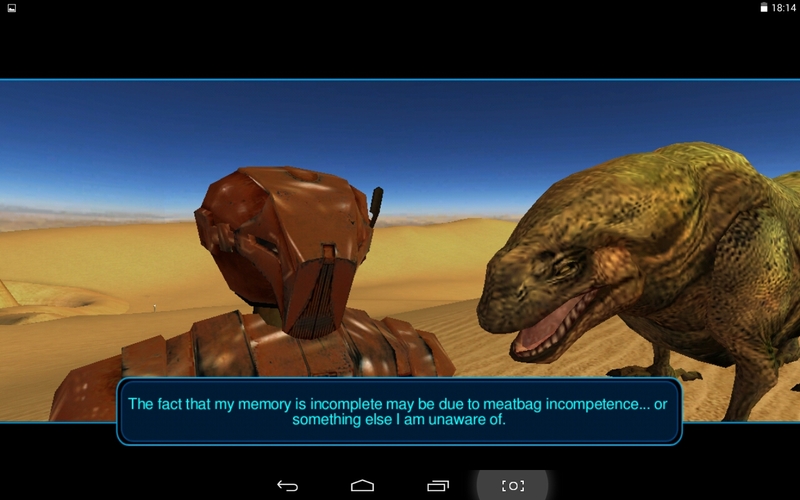 T3-M4: I thought this little droid would be like T7 in SWTOR, but I haven't got him to say anything but "beep" to me. I guess that's more realistic than those beeps and whistles conveying half a novel every time (and my character actually being able to understand it), but it's also boring. The only time I remember him expressing an opinion was when I took him to the droid shop on Tatooine and HK suggested threatening the owner, which got a disapproving whistle (one droid telling another one off I guess). Canderous Ordo: He's a Mandalorian and I've stated repeatedly that I'm not a huge fan of them. Nonetheless I decided to take him out for a bit of questing after he joined me, just to see what he was like, but I quickly had to send him back to the Ebon Hawk because he was just such a jerk to everyone we met! Every conversation went something like this: "I'm so sad, I lost my daughter, sob..." "Well, should have taken better care of her then! Loser." His stories of the Mandalorian wars are interesting though, and I find it fascinating that Canderous paints a picture of the Mandalorians as a lot less concerned with honour and glory than I'm used to seeing in SWTOR. After all he betrayed his previous employer once he got bored of the job, and in his war stories he repeatedly mentions not feeling bad about the deaths of innocents - they just happened to be in the way and who cares. He's really kind of a despicable person but gets a pass from me for still being an interesting character. Juhani: If I hadn't known that Juhani could become a companion, I would have killed her because by god is it the natural thing to do. She is a Jedi padawan who temporarily falls to the dark side after striking her Master in anger and it's your job to stop her or guide her back to the light. I really wanted to keep her alive because of my light-sided nature but it was hard because I had no persuade skill at that point in the game, causing all my persuasion attempts to fail, which in turn results in her going back to howling and pulling her hair (figuratively) every time. 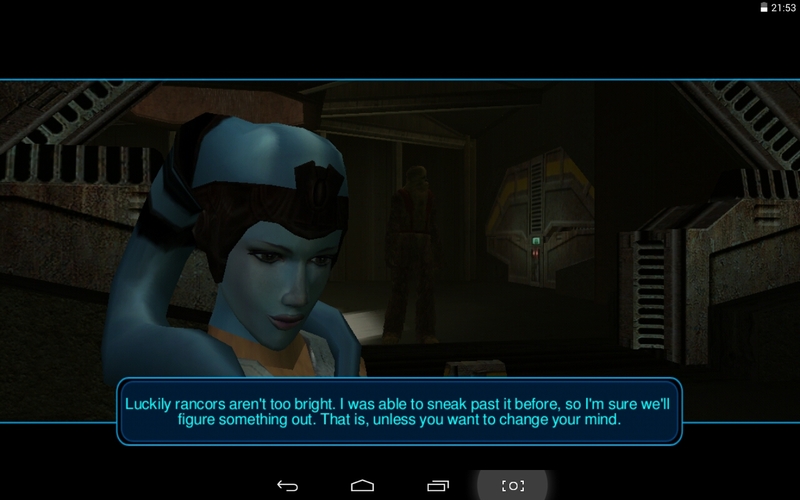 After about ten failed tries or so I found the correct conversation path to persuade her to go back to the Jedi enclave without actually using the persuasion skill but I was already tired of her by then. Her accent is kind of grating, and even after turning back to the path of the light side she keeps getting angry about all kinds of things, which I find super annoying. I imagine she might be fun to have around if you're playing dark side and actively feed her anger issues, but then you probably wouldn't have got her as a companion in the first place? HK-47: I already talked about him as well, and every word that comes out of his mouth speaker grille is fun. Jolee Bindo: I haven't had as much of a chance to get to know him yet since he was the last companion to join my party, and couldn't decide initially whether I found him funny or annoying. He represents the grey Jedi idea very well, never showing much affection or ill will towards anyone or anything, but he has a wicked sense of humour and clearly enjoys winding you up. I'm starting to lean towards liking him. I actually had him as number one first myself, but decided that it was more honest to put Mission first, since she gets to be part of my party while out and about far more often. It's really hard to talk about Bastila without spoilers. You said you know the main twist, but there are a couple other smaller twists and details. We'll see what your thoughts on Bastila are after the full game. 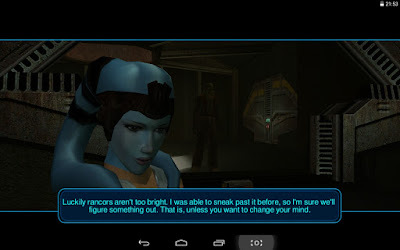 If I remember correctly, at that point in the game, Bastila is supposed to come across like that "overly good" character. I should mention that I generally play as Lawful Good types, and thus have a soft spot for paladins and other Lawful Good characters. I usually enjoy playing lawful good myself, which is why I was quite impressed that they managed to make a character that acts like enough of an over-the-top goodie-two-shoes as to even annoy me! But yes, I'm aware that Bastila still has an important role to play - I'm getting there.